The threat posed by global warming has been gaining recognition across the world in the recent past and the emission of greenhouse gases has been detected as the primary culprit. Collectively, a number of developed and developing economies have pledged to harness the prospects of renewable energy and, among hydro, wind, and solar alternatives, solar energy is emerging as the most lucrative segment of the renewable energy industry. Consequently, the market for solar cables is flourishing, as they provide adequate connection between various electrical elements of a solar panel in a photovoltaic system. According to this business intelligence publication, the demand in the global solar cable market will multiply at a formidable CAGR of 14.1% during the forecast period of 2017 to 2025. The analysts of the report have evaluated that the solar cable market was worth merely US$465.71 mn in 2015 but the opportunities will translate into a substantially increased revenue of US$1,641.92 mn by the end of 2025. Support from several governments to encourage the adoption of solar energy methods, technological advancements in the quality of cables which now are highly efficient in transferring energy as well as resistant to weather and UV radiations, and growing awareness among the urban populations regarding their contribution to the environment by utilizing solar energy are some of the key drivers of the global solar cables market. On the other hand, high cost of these cables, pertinent need to further improve the efficiency, the lack of awareness in several rural areas of emerging economies, and longevity problems are a few factors obstructing the market from attaining its true potential. The global solar cable market has been segmented on the basis of its product type, cable type, application, and end-user. In terms of product type, the solar cable market is segmented into copper and aluminum alloy. Currently, copper-based cables provides for the maximum demand, which is a reflection of its several advantages over aluminum alloys such as flexibility, low resistivity, stability, strength, and better corrosion resistance. Based on cable type, the market has been bifurcated solid and stranded cables. In 2015, the standard cables segment held greater market share in terms of demand, as they are highly effective as far as electricity flow is concerned. Further, application-wise, the market has been classified into solar panels wiring, underground service entrances and service terminal connections. In terms of various end users, the market is categorized into residential, commercial and industrial. Geographically, this study gauges the potential of solar cable market in the region of North America, Europe, Asia-Pacific, Middle East & Africa, and South America. In 2015, Asia Pacific provided for a demand worth of US$281.31 mn and is projected to exhibit an above-average CAGR of 14.9% during the forecast period of 2017 to 2025. By 2025, the Asia Pacific solar cables market is estimated to be worth US$1047.73 mn. This strong demand from APAC is owing to the huge investment from Chinese government and players towards clean energy. Over in India, which is another vastly populated emerging economy, government is offering subsidies to residential and commercial builders to adopt solar energy. Owing to the increasing number of vendors operating in the global solar cable market, the competition is stiffening-up and the scenario is expected to sustain unless a few players expand geographically with their financial might and tap into widespread demand in emerging economies. Havells, General Cable Corporation, Huber+Suhner AG, Lumberg Connect GmbH, Atkore International Group, Inc., ReneSola Ltd, Taiyo Cable Tech Co., Ltd., Ram Ratna Wires Ltd., Prysmian Group, Lapp Group, and Allied Wire & Cable are some of the notable players in the global solar cable market. The global solar cable market report provides analysis for the period 2015–2025, wherein the period from 2017 to 2025 is the forecast period and 2016 is the base year. The report covers all the major trends and technologies playing key role in solar cable market growth over the forecast period. It also highlights the drivers, restraints, and opportunities expected to influence market’s growth during the forecast period. The study provides a holistic perspective on the solar cable market’s growth throughout the above mentioned forecast period in terms of revenue (in US$ Mn), across different geographies, including North America, Europe, Asia-Pacific, Middle East & Africa (MEA) and South America. The market overview section of the report demonstrates the market dynamics and market trends, such as the drivers, restraints, and opportunities that influence the current nature and future status of the market. An attractiveness analysis have also been provided for every geographic region in the report, in order to provide a thorough analysis of the overall competitive scenario of the solar cable market, globally. Moreover, the report provides an overview of the various strategies of key players present in the market. Introduction and market definition chapter helps in understanding different technologies of solar cable along with their applications which are included in the report. The report segments the global solar cable market on the basis of various product type into Copper and Aluminum Alloy. Furthermore, the market is segmented on the basis of cable type into solid and stranded wires. On the basis of application, the market is segmented into solar panels wiring, underground service entrances and service terminal connections. The market is segmented on the basis of its uses in various end-use industry into residential, commercial, and Industrial segment. Thus, the report provides in-depth cross-segment analysis of the solar cable market and classifies it into various levels, thereby providing valuable insights at the macro as well as micro levels. On the basis of country, North American market is segmented into The U.S., Canada and Rest of North America. Similarly, Europe market is segmented into The U.K., Germany, France, and Rest of Europe. Asia Pacific have been segmented into China, Japan, India, and Rest of Asia Pacific. Middle East and Africa covers the GCC countries, South Africa and Rest of Middle East and Africa. Similarly, South American region includes Brazil, and Rest of South America. This report provides all the essential information required to understand the solar cable and its components. Furthermore, Porter’s Five Forces analysis explains the factors which are currently affecting the market. This report also provides the value chain analysis for the solar cable market which explains the participants of the value chain. The report also provides the current market trend impact analysis across each region. 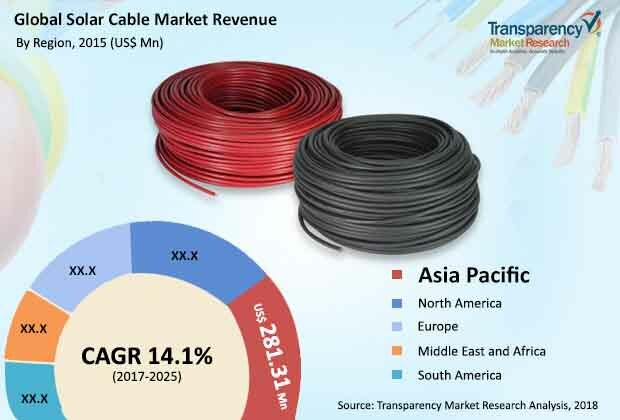 The report also highlights the competitive landscape of the solar cable market, thereby positioning all the major players according to their geographic presence and recent key developments. The comprehensive solar cable market estimates are the result of our in-depth secondary research, primary interviews, and in-house expert panel reviews. These market estimates have been analyzed by taking into account the impact of different political, social, economic, technological, and legal factors along with the current market dynamics affecting the solar cable market’s growth. Some of the key players engaged in solar cable market include various manufacturers such as General Cable Corporation, Huber+Suhner AG, Atkore International Group, Inc., ReneSola Ltd, Lumberg Connect GmbH, Ram Ratna Wires Ltd., Prysmian Group, Taiyo Cable Tech Co., Ltd., 15.3.9. Allied Wire & Cable, and Lapp Group. Details such as financials, and products/service offerings pertaining to these players have been duly provided as part of company profiling.